Presley Cline has put aside dreams of Hollywood stardom and come back to Ellery, Tennessee, to work in a beauty shop. In truth, the dreams in question were more her mother's than her own. Presley may have the face and body of a movie icon, but she lacks the stomach for it. Yet a loving relationship and normal home life seem almost as unattainable as an Oscar. Being able to see and speak to dead people certainly isn't helping. 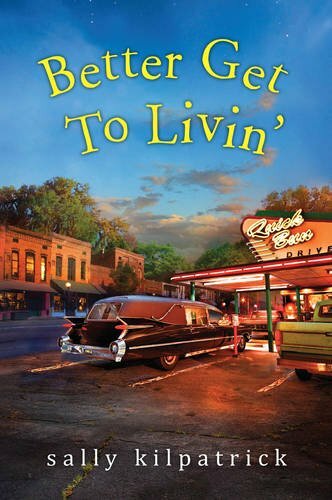 Sally Kilpatrick takes readers back to the small Tennessee town of Ellery for her third novel. She knows her small, southern towns well and has a knack for painting both the positive and negative aspects of living within one, especially in regards to perceptions about people that are set early in life. Both Declan and Presley are much more than what the people of Ellery perceive them to be or even what each of them perceives the other to be. When Presley returns home broke after being at the center of a Hollywood scandal and having all her money stolen by her cheating boyfriend, she talks her way into a job at the local beauty salon where she's assigned funeral home detail. Soon after, when a tornado hits Ellery, destroying her ailing mother's trailer, an offer from Declan to take shelter at the funeral home puts them in daily contact and opens the door for their attraction to deepen. It also gives them the opportunity to look beneath the surface (their own and each other's), explore possibilities, and question what they really want. Are they content with the decisions family obligations have nudged them into making or is it time to reassess their dreams and get to livin'? The pace of this book is relaxed with the building of a relationship between Presley and Declan, gentle and gradual. 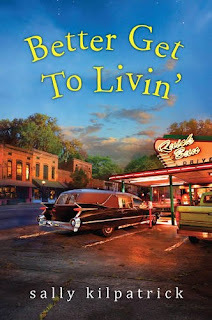 I was quickly drawn into the story; Kilpatrick's realistic characters and down-home charm making me care about these individuals and the triumphs and tragedies of their lives, with her sense of humor never failing to delight. First person narrative doesn't always work for me but, in this book, with the alternating chapters told from Declan's and Presley's points of view, it gives the reader the necessary insight into each of these characters that's needed to understand their actions and emotions, propelling the story as well as their relationships with their families, and each other, forward. Secondary characters add humor, chaos, and emotional depth to the overall story with Uncle Hollis (who shares Presley's ghost communication skills) being a particular favorite. Resident ghosts, a reluctant-mortician hero, a down-on-her-luck-actress heroine and a solid supporting cast all wrapped up in Sally Kilpatrick's heart-tugging emotion and quirky, southern humor? Yes, please! This does sound quirky, but fun. First person is hard for me. I've never liked it. Not every author can pull off first person and leave me satisfied, Deb but Kilpatrick does it very well. I've thoroughly enjoyed all three of her books. Sounds like a good book! I love reading about ghosts. This sound like a fun book to read. Ghosts that meddle. Sounds like a book I would like to try. Not sure if I have read her before will have to look her up.